I’m often asked what gives me the most hope in the Archdiocese of St. Paul and Minneapolis. It’s a tough question because there are so many signs of life in this local Church. A recent trip to Indianapolis for the National Catholic Youth Conference, however, may have tipped the scales in favor of the youth of this archdiocese. The 90 young people from this archdiocese impressed me with their commitment to growing deeper in their faith, their interest in the big faith questions of our day, their willingness to step up to serve, and the ease with which they navigated racial, linguistic and ethnic differences to form new friendships. Even for our multicultural archdiocese, it was a particularly diverse group, with more than three-quarters of our delegation coming from immigrant families from Southeast Asia and Latin America. When our delegation gathered for a pre-event meal, grace was offered in English, Spanish and Vietnamese. I had been to this event twice before and always found it exhilarating — there’s an electricity in the air whenever you have more than 20,000 energetic teenagers gathered in one place to learn more about their faith, support one another in discipleship and give praise to God. You could have heard a pin drop on Friday evening as the Lucas Oil Stadium became a huge chapel of adoration. The teens embraced the silence and solemnity of the ritual far better than I. As providence would have it, the teens of our delegation were disproportionately represented in leadership roles at the gathering. I think that my brother bishops were tired of being poked as I pointed out that the readers at the prayer services were from the Twin Cities, as were the teens who led the opening procession, the Vietnamese dancers and a sizable portion of the choir. 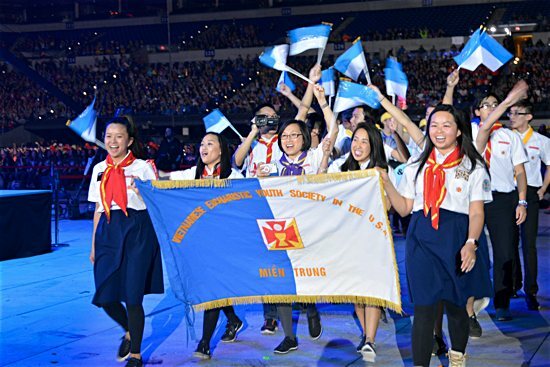 Whether they wore the uniform of the Vietnamese Eucharistic League or the unique “duck, duck, gray duck” T-shirts that had been designed for our delegation, they were easy to pick out in the crowd and on the jumbotron. I gave thanks to God for their talents, their creativity and their faith. I left Indianapolis more convinced than ever that the Lord has placed the future of our archdiocese in good hands. I was particularly grateful when I recognized that so many of those hands — while Minnesotan through and through — belonged to young people from families that found their way to our archdiocese as refugees and immigrants. Not surprisingly, there were some young people and youth leaders with real anxieties about their future in our country or worries about their family members — worries that teenagers and young adults shouldn’t have to shoulder. Pope Francis has recently inaugurated a two-year campaign, “Share the Journey,” that calls for all Catholics to grow in our understanding of the experiences of our immigrant and refugee brothers and sisters in a way that increases solidarity. The Holy Father has asked us to get to know the stories of our neighbors who have left their homelands and found their way to our archdiocese, to become more aware of the circumstances that led them to immigrate or seek refuge, and to grow in our appreciation of the challenges they face and the ways in which we can be of fraternal assistance.